March 2016 – The Northeastern quadrant of Arizona and a bit of southeastern Utah is the Navajo Nation, an Indian reservation that is over 27 thousand square miles. It is larger than the state of West Virginia (~24k sq. mi.). It is also larger than the states of Massachusetts, New Hampshire, Rhode Island and Delaware combined, with enough left over to add in the southern half of Vermont. Just under 175,000 people call it home. 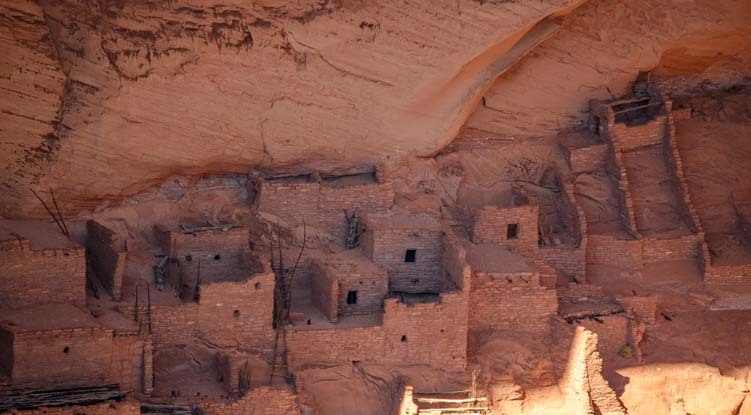 Within the borders of the northern part of the Navajo Nation, the National Park Service manages the Navajo National Monument, an area where there are some ancient Indian cliff dwellings and ruins. Navajo National Monument is home to ancient Indian cliff dwellings. One is in a cave across the canyon. 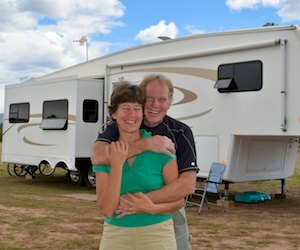 After visiting stunning Horseshoe Bend and Lees Ferry near Page, Arizona, we drove our truck and trailer across the northern part of the Navajo Nation to see Navajo National Monument. 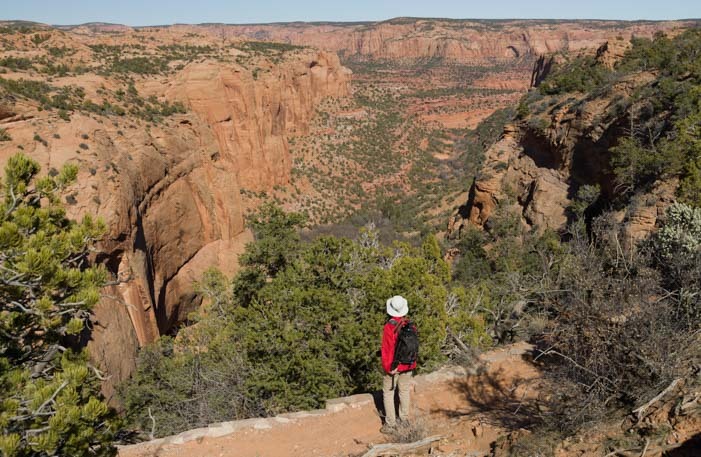 There are three short hikes at Navajo National Monument, each one progressing along the canyon rim and offering views down into the canyons. We started with the Sandal Trail which was an easy stroll on a paved path to a viewpoint at the end which looked across the canyon at the Betatakin Ruin. In the summers there are guided tours of these ruins, but they don’t start until May 29th, and we were there in mid-March. But the view of the ruins — with binoculars or our long telephoto camera lens — was wonderful. The Betatakin ruins are in the back of this cave. In the summer months you can take a guided tour of these ruins. We were there too early! The Canyon View Trail hike gave us views of this same canyon, although there were no Indian ruins to be seen. The Canyon View Trail gave us different views of the same canyon. Unlike the first two “mesa top” hikes, the Aspen Trail hike descended down into a canyon and gave us a terrific stair-stepping workout going down and then climbing back out. We were definitely missing the “prize” at this park since we couldn’t do any tours of the ruins themselves, but spring was in the air and wildflowers were just starting to bloom. Pretty wildflowers on the trail. 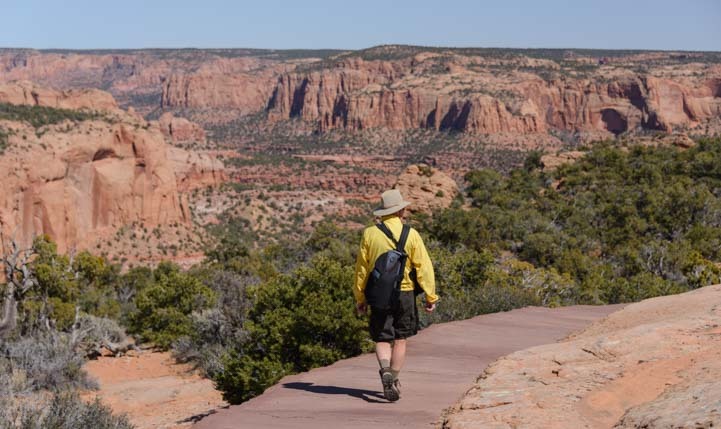 There are two dry camping campgrounds at Navajo National Monument, and they are free. Only one campground was open (and only two campsites were being used! ), and with some jockeying a bigger rig could fit during seasons where there is little traffic. 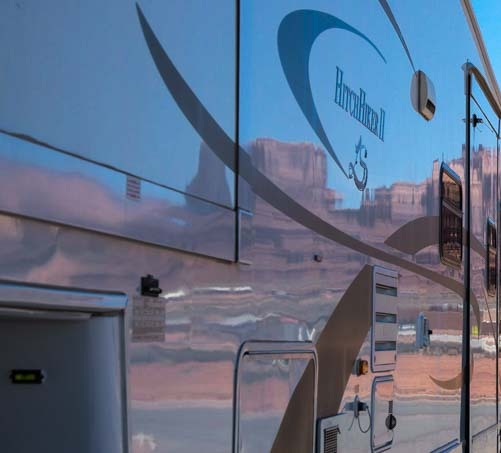 The signs give RV size limits of 25′ to 32′, depending on the sign, not just in the campground but on the road leading to Navajo National Monument, but in reality a 35′ fifth wheel could manage in one or two of the campsites we saw (with patience). Busy summer weekends might be more hair-raising with a big rig. This is high desert country (7,300′) so it was quite cold during our stay, but we saw a beautiful sunset. Remote and quiet in March, we had the sunset to ourselves. Traveling northeast from there, we passed through Monument Valley, which sits on the Arizona and Utah border. This ia a vast flat plain that is dotted with towering rock formations. The most dramatic rock formations of Monument Valley are in the Monument Valley Navajo Tribal Park in the Navajo Nation, a four mile detour east of US-191, the road we were on. We decided to save a trip there for another time, but stopped in at a Welcome Center to get some info. When I walked in the door, I expected to see racks of literature and a helpful person behind a desk. Instead, I found myself staring at the backs of several rows of people in folding chairs listening to a man giving a speech. His voice was low, melodic and wistful. And the language he was speaking was Navajo! I wasn’t sure if I should back out quietly or stick around and see what this was all about. Suddenly, a woman approached me and whispered and gestured towards some pamphlets on a table. She wanted me to sign a petition. “What’s it for?” I whispered. 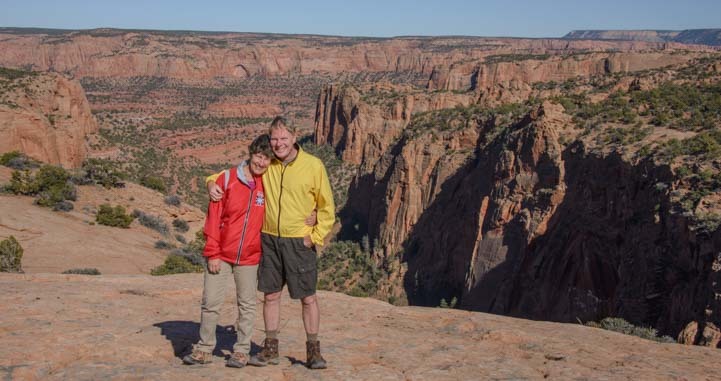 “It’s a petition to create Bear’s Ears National Monument,” she said. She handed me a map and a glossy brochure. Indians sell crafts from stands on the side of the road. It turned out that the Navajo Nation (together with 25 other Indian tribes) has approached the federal public land agencies for help protecting their artifacts, relics and ruins. They have been struggling with preventing the desecration of archaeological sites (ancient ruins and petroglyphs), and they want to phase out mining too. The Navajo have never sought this kind of help before, but apparently they simply don’t have the manpower or the authority to protect the unique archaeological sites. So they are proposing to convert 1.9 million acres of land (about 3,000 square miles) into a National Monument. The parcel of land is enormous. It is the size of Delaware plus half of Rhode Island. It is a triangle that stretches, more or less, from a bit SW of Moab, Utah, in the north, down about 90+ miles to the Utah/Arizona border in the south, and westward about 50 miles to Glen Canyon, and then about 80+ miles back up on a diagonal along the Colorado River towards Moab. 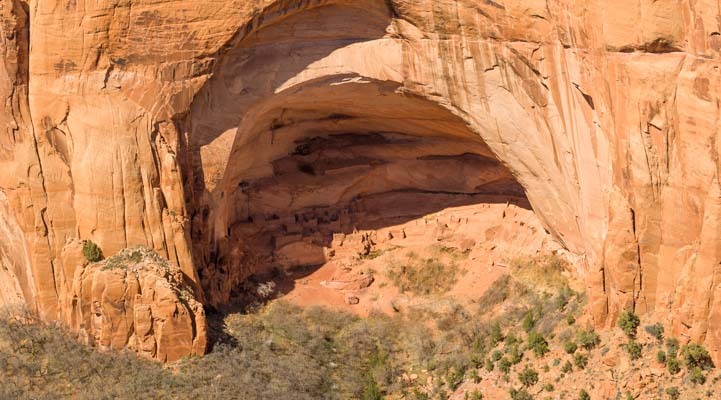 The popular landmarks and destinations of Natural Bridges National Monument, the Valley of the Gods, Goosenecks State Park, Newspaper Rock and Manti La-Sal National Forest would all be enclosed inside the boundaries of the new National Monument land. Canyonlands National Park and Glen Canyon National Recreation Area would border it to the west and south. The north-south highway of US-191 would be outside the eastern boundary but would more or less parallel the eastern border of the National Monument between the Moab area and the Arizona/Utah border. This proposal is unique because it requires cooperation between several different agencies that manage public land, including the US Forest Service, Bureau of Land Management, and National Park Service, all of which manage portions of the land parcel already (most of the land is currently under BLM management). The organization that is behind this and that was making presentations and gathering signatures to present to President Obama when I walked in the door is called Utah Diné Bikéyah. “Diné” is the Navajo word for the Navajo people. I spoke briefly with Gavin Noyes, the Executive Director. He explained that this has been in the works for a few years and that the hope is that Bears Ears National Monument will be created by President Obama before his presidency is over. He explained that in many ways the process is being modeled on Grand Staircase Escalante National Monument, another ~3,000 square mile public land conversion in southern Utah that was designated a U.S Presidential National Monument under the Antiquities Act of 1906 by President Bill Clinton. Grand Staircase Escalante was created to preserve unique natural treasures (like red rock formations). Bears Ears National Monument will be created to preserve Native American cultural and archaeological treasures (ruins and petroglyphs and ceremonial sites). The landscapes in this corner of the world are stunning. I asked what the impact would be on recreational use of the land, like dispersed camping, hiking, mountain biking, rock climbing, etc. 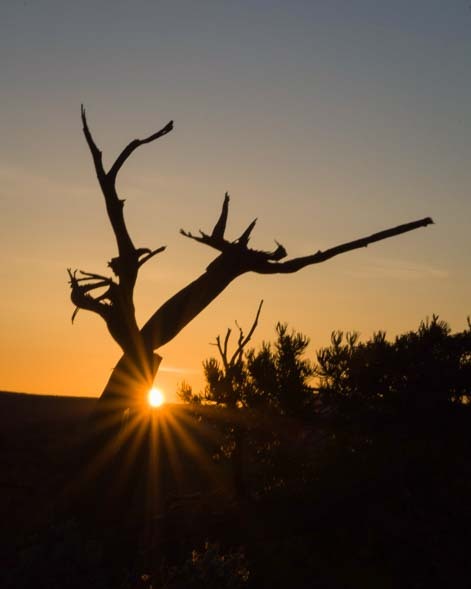 Gavin explained that the intention was for better management of the archaeological artifacts and that recreational use would still be allowed, just as it is still allowed in Grand Staircase Escalante National Monument. Photos in the proposal’s brochure show situations where people have attempted to remove petroglyphs from rock faces by cutting them out with high powered saws. They also show images of mining and other commercial land use. These are the things that this proposal is seeking to eradicate. Of course, even presidential protection doesn’t guarantee anything. In 1955 President Eisenhower protected a four square mile portion of Tonto National Forest in Arizona, making it off limits to all future mining. 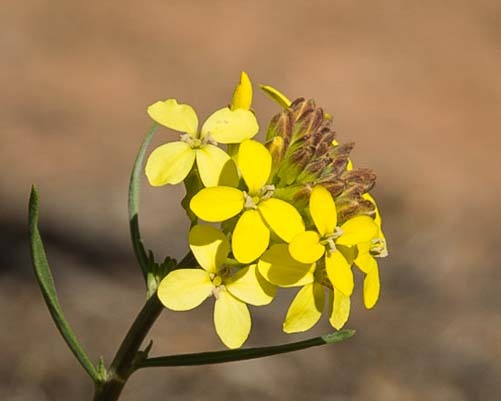 In late 2015, that was overturned by the National Defense Authorization Act, signed into law by President Obama, enabling the very same National Forest public land to be sold to a private, for-profit Australian and British mining operation. Eventually, this mine will destroy a beloved recreation area once used by campers and rock climbers that at least one president sixty years ago thought was worth hanging onto. (More info here). An editorial in the LA Times by former Secretary of the Interior (1993-2001), Bruce Babbitt, spells out all the political back and forth that is going on behind the scenes. Just like the situation that arose in Tonto National Forest where foreign copper mines have trumped recreational use of America’s public land, mining seems to be playing a central role here as well. All of this was news to me, and perhaps it is news to you too. I am sharing it here because the recreational use of public land is a large part of what this website is about. 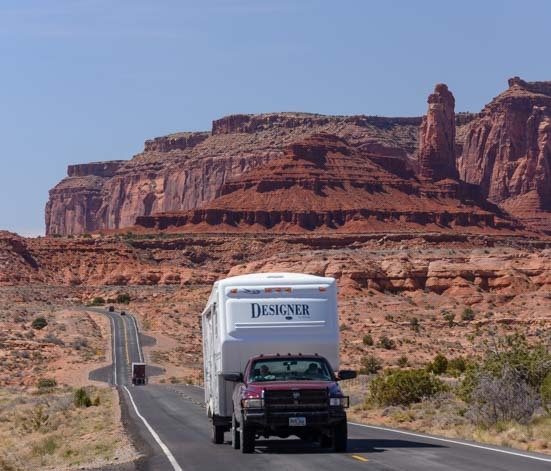 Our RV roadtrip through Bears Ears – The stunning Bicentennial Highway bisects the proposed National Monument east-west, and we drove it from Blanding westwards to Glen Canyon in 2012, stopping at Natural Bridges National Monument on the way. This entry was posted in Arizona and tagged Arizona, Arizona Northeast, National Parks US, New, Travel, USA, WP Travel by Roads Less Traveled. Bookmark the permalink. On our way from the Grand Canyon to Moab, we also stopped at the Welcome Center. There was either a wedding or baby shower going on and it was closed. It must be a tribal multi-function Welcome Center. It was so windy that day, that we could barely open the doors on the truck. We saved our visit for another day and headed to Moab. We love your blog! I think you’re right, Mike, it must be a tribal facility of some kind. We were lucky out there and didn’t have any wind, but last night in Moab the wind bounced our trailer around so much it felt like we were back on the boat and we were going to sail away! Thanks for reading. Who knows! Just hoping dispersed camping and other recreational activities continue to be allowed. Super write-up on Navajo NM, Laurel. We will definitely get back there and do the tour at some point. It sounds like your guide Jimmy did a terrific job, and what a fascinating place! Very funny, Rose. There’s a fine line between roasting and freezing, and we’ve done both. This year we’re leaning towards freezing as we go north, and we’ve been snowed on twice! !